If I have a research & mining outpost established on the surface of Europa, in which there is a small complex of buildings, how do I claim to have them protected from potential breaks in the ice (either from proposed tectonic activity or thermal vents breaching the ice)? Having all of the buildings compose a singular ground-unit to maintain the outpost integrity in the event of a break in the ice. Having the buildings mobile in a way that can travel over ice (i.e. treads) to allow for movement in the event of ice shifting or breaking. This would, however, prevent the base from being anchored. Neither of these are truly protective measures though, so how can I justify that they're protected enough to bring the level of risk into acceptable levels? I mean I have to convince people to want to go in the first place. The Earth has tectonic activity: both earthquakes and "thermal vents" that spew fiery rocks out (i.e. volcanos). How do you know you aren't in danger of being volcano-ed into the stratosphere as you sit at your desk typing questions on Worldbuilding? The answer to that question is that tectonic activity and volcanoes follow well understood patterns. If you are typing in Nebraska or Latvia, you are at almost zero danger from either. If you are typing in Lombok or Antigua, Guatemala, you are at a significantly elevated risk; though not so elevated that hundreds of thousands of people won't live there. If you are currently typing from inside Erta Ale, you are either dead already or some sort of fire elemental. So the simple answer is that geologists will study Europa, then people will build outposts where the tectonic dangers are not significant. In the case that your entire planet is shifting ice (note: I do not think this is the case with Europa! ), then the example of Halley research station in Antarctica is instructive. 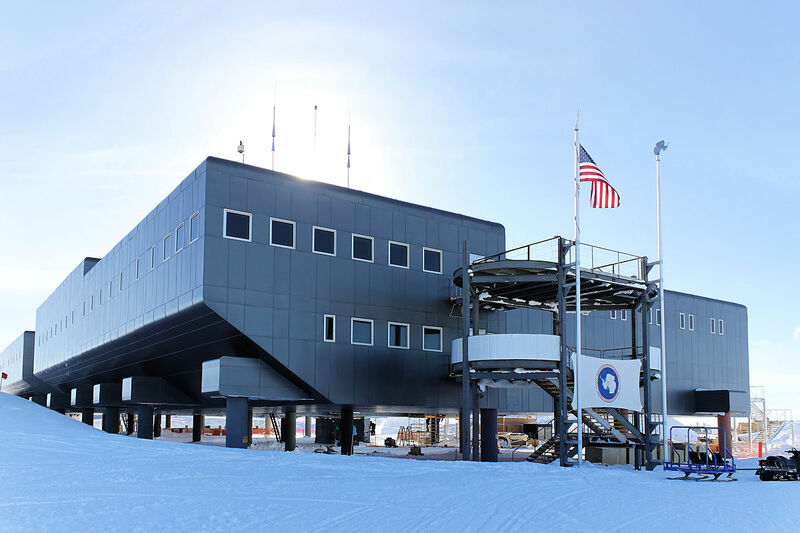 This British base has been in place since 1956, built on a floating ice sheet. It has been rebuilt/moved five times due to various snow and ice calving related dangers. So even in dangerous locations, you can still operate a base safely for decades with a little geological knowledge. You do not need to worry about weather or wind on Europa. A light, self contained inflatable structure will be intrinsically earthquake proof because it is not attached to the substrate, just resting on it. If the bottom is insulated with mineral wool that should do against hot jets from below. If it falls into open water it will float. 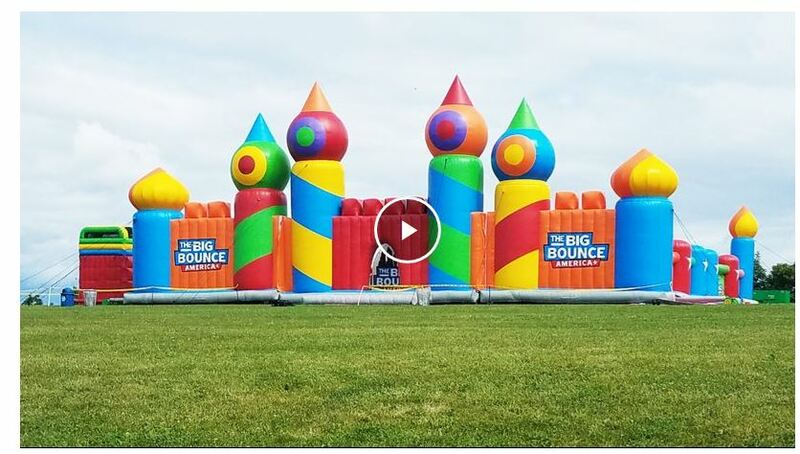 You could (and should) make an inflatable structure modular, so you can expand and rearrange space to fit current needs. Modules which break away under stress (you can have them self-seal if interior pressure drops) will limit damage to the whole and would serve as extra insurance against seismic events. Inflatable structures make tons of sense for places like the moon or Europa. Inhabitants need a pressurized atmosphere anyway and the atmosphere can serve double duty as a structural component. Many people talk about building the platform on legs or pylons to keep level on shifting ice and move if required, but the much larger danger for a surface platform on Europa is you are in the insanely dangerous radiation belts of Jupiter, and will receive a lethal dose rather quickly. Even electronic machinery will be effected by the radiation. You will need a massive amount of shielding, for example melting water and filling a dome over the station with a shield at least 5 metres thick. Burrowing into the ice is also an alternative, minimum depth would be 5 metres, but the ice sheets are thought to be kilometres thick, so you can go down a considerable distance, or even into the ocean itself. Careful observation of the surface before landing and drilling operations are conducted should;d identify large and stable ice sheets. The networks of lines on the surface ice may indicate the places where the ice sheets meet, and should be avoided. So a surface platform is likely not the best solution for working on Europa. Good propaganda, you can never guarantee the safety of anyone, alive or dead, anywhere. You can take precautions, yours are sensible, (I would suggest that a mobile lab stay moving at all times to reduce the chances of the lab's weight creating an issue) I'd add overall buoyancy of the structure, it's not sitting on the ice, structurally speaking, it's just resting on the ice as somewhere to be. But ultimately any claim of total safety is something of a lie. You cannot protect anything against shifting ice. Modern scientific bases in the Arctic and Antarctic are all build on stelts and able to "climb" up on fresh snow to not be buried in the ice. To be clear: the problem on Europa is not that you could fall through the ice, but that the ice is constantly cracking and shifting. To not fall into big cracks in the ice, your buildings should have protusions on each side, making the ground area wider than the building itself. On Europa gravity is lower than on Earth, so you shouldn't have problems making buildings mobile. Either put them on wheels or on movable legs. Space probes have shown giant fountains of water erupting from cracks in the ice, so you must prevent your buildings being swept away. You should anchor each building on its own tether. Emergency measures could consist of heat sources to melt approaching ice. That could be flame throwers or exhaust of combustion engines (your outpost had to land in some kind of space ship, right?). But with all these measures, there is no safety from shifting ice. 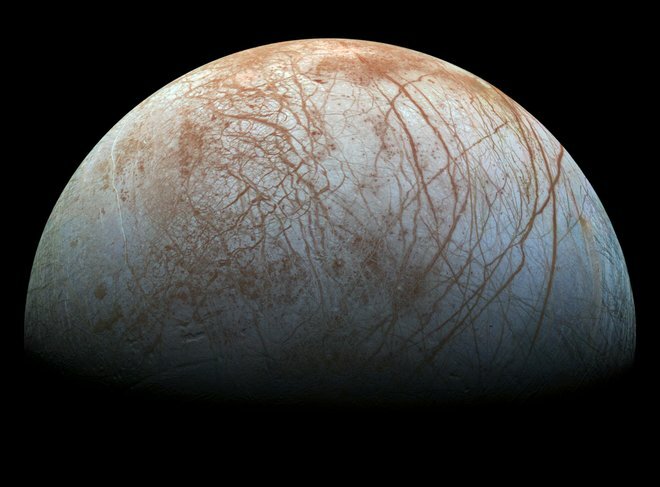 Europa is constantly kneaded by gravity, which cracks ice quite fast. Giant floes, shards and spikes might shoot up right under your building. If I recall correctly, the ice of Europa is pretty thick. You'd have to drill down into it for a little ways before you hit water. With that in mind, you might want to invest in technology to detect where ice is thin or thick, or if ice is currently thinning in a location where a base is built. If the ice begins to thin, it's time to pack up and change location, and since you have a tool to help give you some advanced notice of thinning ice you can afford to have an anchored in base of operation, since you'll have time to un-anchor and move. Build a large flat surface deck a bit like an oil rig and place the base on top of this. From the bottom of that surface extend several dozen strong vertical metal supporting struts that rest on the surface of the ice and can be raised or lowered through the deck. Continually adjust the length of each strut to ensure that the base remains even and level depending on the ice level immediately below it. The strut movement motors could be connected to strain gauges to automate the process. The bottom of each strut could be heated temporarily to make the raising and lowering easier. The base should be built away from the centre of major fractures in the ice to prevent the need for excessive amounts of strut poles in very deep cracks. The deck base should be as wide as possible to ensure maximum stability. You can string out wire cabling in a mesh pattern to try to bind the ice more securely together. This can be done over 1000 square yards, or 1 square mile (or whatever units or size you prefer), depending on your scale and desire for security. The wire would have to be embedded into the ice, which could be done by simply heating the wire until it melts into the ice. Trenching the ice, then melting the debris back on top of the cable works, too. Once this is in place, build your research area in the center of this mesh. Since you want stability, you can do a more dense mesh in the center and build a platform/foundation to extend beyond your building's walls to attach to more of this mesh. To get more security, attach the cables together at their intersections, rather than just draping them across each other. This could be welding them or a simple bolt on clamp. With the clamp, it could be weather treated from the factory, where it would have to be treated onsite after welding. However, welding equipment would be already standard issue equipment, whereas the clamps would be a specific use case and weight more than a spool of welding wire. Gotta weight those pros and cons! This should also help prevent your buildings from sinking into the ice. If you made the mesh out of metal and designed/constructed it correctly, this could potentially double as a very large radio antenna. 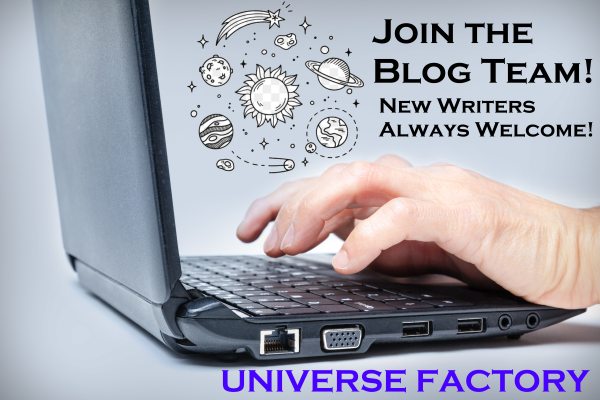 Must they be on the surface, or is simply on Europa good enough?. As discussed in this question it would be feasible to have a city hanging down into the ocean below the ice supported by the city's buoyancy. The structural integrity of the ice is therefore not a concern, and presumably one would not place the city above an active vent. A Spy in Europa by Alastair Reynolds describes such a city. Not the answer you're looking for? Browse other questions tagged ice mining safety or ask your own question. Hanging city on Europa, is it feasible?